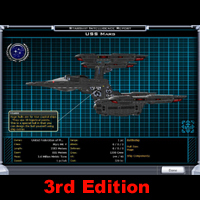 3rd Edition to the SF Federation Vessels. Please delete vessels from previous edition because they will not work with the new Player useable ship style. So now when you pick the Federation Ship Style you will start the game with 3 correct Federation Vessels. 26 total vessels and a Federation Race Logo(originally posted to the Library by XISKIO. So as I said if your is working correctly you don't need to redownload. Just wanted to give my thanks for these ship designs. They look really great in-game. Awsome , hopefully will see a Romulan D'deridex class warbird too . I tried didn't look to good . Major improvements awsome ships . Have you tried anything for the Cardasssian ships ? It works when I play as the yor. I will install it again and check if it works with the yor. I just reinstall the shipcfg folder myself. I picked the Arceans and assigned the Federation ship style and it worked perfectly. Make the shipcfg folder is place correctly. That might be your problem. If not check the forum page I mentioned in the comment. Perhaps someone had a similar problem. I was wondering if the shipconfig folder might of caused the crash? This version is the correct version. I will delete the same files in my computer and reinstall to see if I have the same problem. I dlld and installed it by accident please put the new verson up soon. It' doesn't work. I followed the instructions but when I start the game with the federation ship style the game crashes. Please help. Also guys this won't need to be revised so don't worry about downloading and then having to overwrite it. The only thing in this mod that will change is the Shipcfg folder but that update will appear in a seperate mod. There will be future expansions packs to this but they will not effect the shipstyle folder so I'll make them seperate downloads. Expansion packs will include mobile Battlestations. Ok now you can download this one. Don't download this one. Library doesn't seem to allow me to upload the correct one. I'll add a new comment when the correct one is loaded. They won't work in Dread Lords(as far as I know) which is probably why they don't work. They will appear in Dark Avatar but the parts will look wrong on some of the ships. They were made in Twilight of Arnor so I recommend that one. 3rd Edition coming soon. Visit: http://forums.galciv2.com/313557 for updates. Thanks for the info and thanks for the update too. Hmm, what verstion of Galciv2 are you playing? Love the ships but like ice I cannot get them to work, the names (in the shipyard screen in game)are there but no ships, perhaps these cannot be used without on of the expansion packs? posted my data on your forum with a screenshot. This is the only pack I have trouble with. The klingon ,romulin, gorn packs are fine but the fed pack loads up all the ships on the 1st turn without the pictures? (except a frieghter) Any ideas? Well there are no tiny ships, freighters, or spore ships in this pack. They are going to appear in a future expansion pack once I've completed the new races. As for your problem, a few days ago I reloaded the ships on to my computer and it worked fine. You sure you didn't make a mistake somewhere? http://forums.galciv2.com/313557 to see if anyone else is having this problem. Ice Castle, once you install them, if you play as the Terrans they will appear as you get the appropriate technologies. The shipstyle folder will be uploaded to this site, tomorrow. You will just have to wait for it to be approved. 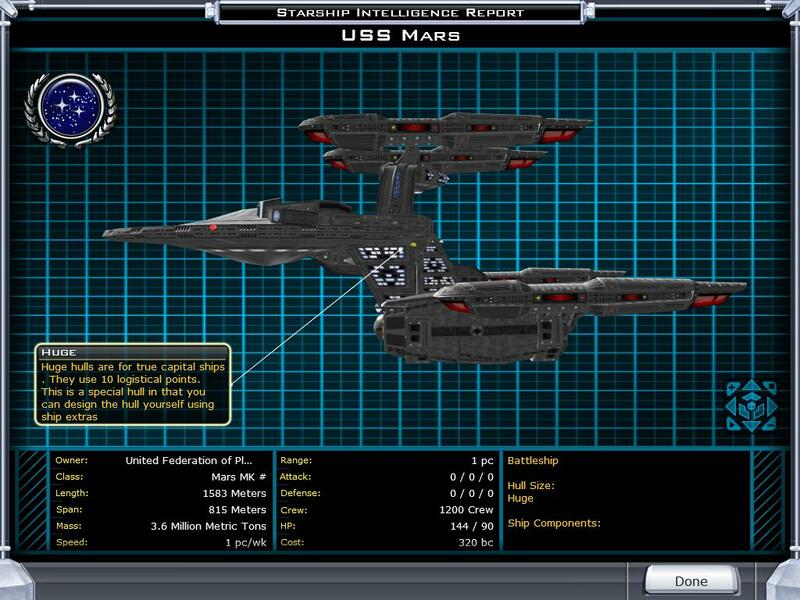 Looks nice .I wish I knew how to get some of the federation ships to work. I don't know how to create a style for the federation vessels. Thanks. I found a problem with the Mars and Ranger classes. I fiixed it now.